You can mix your medication in videogames, and unlike real life, nothing bad will happen to you. In the real world, ingesting the venom of an enormous radioactive scorpion is really a good way of dissolving your innards, but in Fallout: New Vegas it actually has positive medicinal effects. New Vegas isn't alone either, with plenty of other games encouraging players to guzzle medicines and pills like candy, or indeed, guzzle candy like it was medicine. In Issue 297 of The Escapist, Peter Parrish talks about the amazing state videogame medicine, where dabbling in experimental drug cocktails is actually good for you. 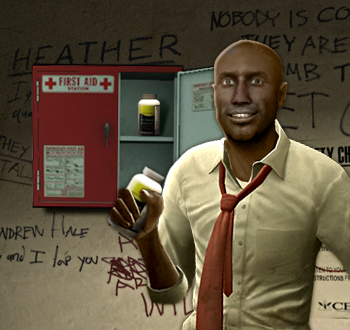 The Left 4 Dead universe is a grim and foreboding place, populated entirely by zombies, people who are about to become zombies, and enthusiastic, devil-may-care pilots. With that in mind, it's maybe not surprising that survivors are so keen to knock back entire bottles of pain pills. But it's a little more unusual that nobody suffers any ill effects from these decisions. Likewise, in Alpha Protocol, the only decision super-agent Mike Thorton doesn't have to agonize over is whether it's safe to consume every bottle of pain medication in Rome. Thorton's missions aren't so much a series of linear objectives as a calculated pharma-crawl from medicine cabinet to medicine cabinet. We're at the point where we barely think twice about any of this. As players we have a Pavlovian response to health items. The only thing triggering in our brains when we guzzle a crate full of pills is, "Ooh, health jackpot," when it should be, "Good heavens, my pancreas just melted." Somebody without a morality gland could let the pharmaceutical industry know that videogames are doing a terrific, daily job marketing its products as panacea. It's not really any surprise that games take shortcuts with medicines; the real treatment for radiation poisoning requires an isolation chamber and bone marrow transplants, and would rather break New Vegas' flow. You can read more about videogame medical science in Parrish's article, "Pills Here."